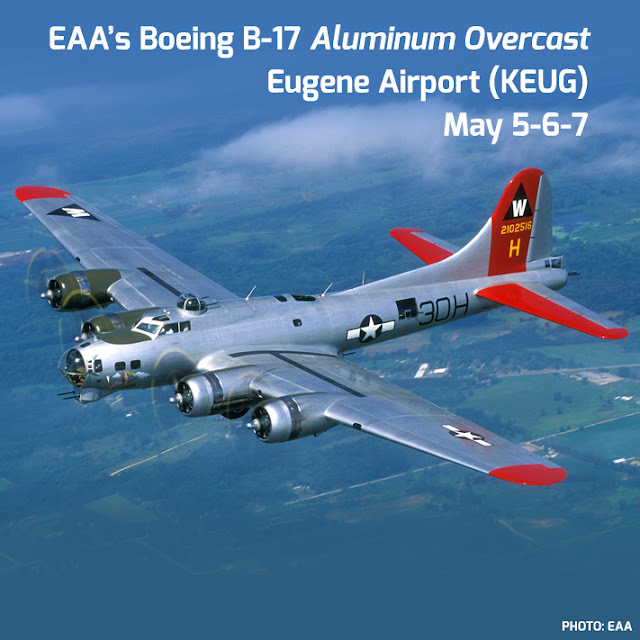 It probably goes without saying that all readers of this blog would go nuts if they were offered a ride on EAA’s beautiful Aluminum Overcast B-17 slated to come to my home airport of KEUG in Eugene, Oregon May 4-7. Filling this airplane’s 10 seats with avgeeks would require a lottery, there would be that much demand for a free scenic tour of the Willamette Valley inside this historic ship. And in normal circumstances, as a long-time media/PR guy, I would have no problem filling those 10 seats with local media for the one flight EAA schedules at each stop for that purpose. We brought Aluminum Overcast to Eugene in 2013, and the media flight filled up in one day, although a few outlets bailed at the last minute, leaving two seats open. Lucky for us, one of our chapter 1457 members knew a guy who knew a guy who said he could get us (wait for it…) Puddles, the mascot of the University of Oregon Ducks! In these parts, the Ducks mascot is cherished, so a few calls were made, and BOOM, we had a giant green and yellow duck on our media flight! I hoped we’d get some social media love from the UO student cheering section on Twitter because of “The Duck.” But while that didn’t happen, but it was sure hilarious…see my photo gallery here. I know media people very well, being part of this scene from every angle for parts of five decades. EAA’s Tour team did not seem particularly concerned about the other B-17 being in our market a few weeks before Aluminum Overcast was to arrive, and I worked with national in Oshkosh to come up with a plan to garner maximum buzz in the local media. Led by Kristen Busse, EAA B-17 Tour Manager, we are moving forward with great confidence in what she and her team are accomplishing. EAA addressed the situation of possible B-17 story saturation with the addition of a second media flight. You would THINK that we’d have less media involved due to story saturation, but with 20 seats now available to fill, our plan was for EAA’s PR team to handle the print and TV people while I focused on on-air radio talent, asking them to trade live chatter on their morning shows for two B-17 ride vouchers for each station to use as prize giveaways. With 10 seats available on my media flight, I went to work by burning up my email, contacting every station in a 50-mile radius that had any sort of live show, or did actual audio journalism. Maybe the Madras people didn’t work the radio people very hard, or maybe these stations just love free swag worth $950, but I got immediate response from a LOT of stations. In fact, I filled that second media flight in just a few days. We now have five stations in our market willing to talk up the Aluminum Overcast tour stop as they give away their pair of ride vouchers. I have the large “new country” FM stations, FM classic rock and AM news/talk stations, and even the Oregon Public Broadcasting affiliate. We are going to saturate the airwaves the week leading up to our B-17 event. During the week of May 1-5, you will not be able to turn on a radio in this market without hearing about a very cool vintage airplane ready for public inspection at the Eugene Airport. And this does not even include the 10 seats the EAA team are filling on the first media flight for print and TV outlets. I helped them out today by booking a large TV station in our market onto that flight for a reporter and camera operator, and the EAA crew are working the phones and email to fill the remaining seats. Our chapter also has attracted three $1,000 sponsors event sponsors, with that money going directly to EAA national to help offset the costs of flying an old fuel and oil-guzzling WWII bomber around the Lower 48. Each one of those grand-level sponsors gets a seat, and Chapter 1457 really thanks them for their support. All of this work both here in Eugene and back in Oshkosh is for one reason: Making sure EAA remains on mission, because they are an organization that is as vital to GA advocacy as AOPA, HAI or NBAA. While all four acronym groups have different missions, funding EAA’s programs like Young Eagles while also helping them to keep Aluminum Overcast and their Ford Trimotor flying around the country is very important for every EAA chapter. I am personally thrilled that the experimental aircraft builders, certified airplane owners and GA enthusiasts in Chapter 1457 here in Eugene, Oregon are doing our part to push GA and EAA forward. Because that’s what pilots do.